NEW--Junior Tally Book with ring binding at the top, and protected by the cover. 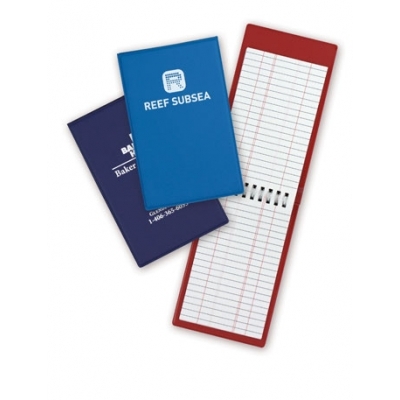 For Your Oil and Gas Record-Keeping Duties. This tally book is small enough to fit into most pockets, and easily flips open when you need it. It has a half-size front pocket and a full-size back pocket, for keeping business cards and other notes or keys, or data tables. Material: Vinyl, hard bound cover. The cover protects the ring binding when closed. Paper Pad: The 100 page Water Resistant Stone Wire-o Pad stays open easily and can be laid flat for use. You can write on it with any writing instrument, and it will not wash or bleed in moist environments. Price includes pad, vinyl cover, with 1 color, 1 location hot stamp imprint on the outside front cover. Imprint size: For hot stamp imprint: 4" x 2 1/2". Imprint size for optional 2-color, 3-color, and Full-Color imprint: Full front and back. Option: 2-color, 3-color and Full color imprint at extra charge shown in drop down menu above. Option: Color matching the imprint colors to your logo is $25 per color. Free if they are our standard imprint colors. Send us your logo for a quote. Our art department can pick the best imprint method to make your imprinted logo look great! Whether hot stamp, screen printing, or full-color imprinting. We have kept this page simple, for clarity. But, our printing processes are very versatile.